Planner based in Bristol since April 2015 Sean completed his Masters in Town and Country Planning at the University of the West of England. 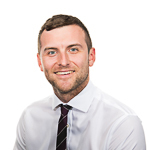 Before joining Tetlow King Planning, Sean worked at John Rowan and Partners. At Tetlow King Planning, he has worked on a variety of projects including residential schemes; advertisement consents; affordable housing representations; market and demand appraisals; supported living schemes and objections.